First things first, yes I am wearing two different pairs of shoes in these photos because I couldn't make up my mind which I preferred. LOL So I decided to take pictures with both since I have worn this outfit both ways and love each look equally. Second, this outfit is comprised of every piece that is a basic in my upcoming summer wardrobe (with the exception of the ankle boots though I do wear them year round). Straw hat - yup, that is a non-negotiable for me. 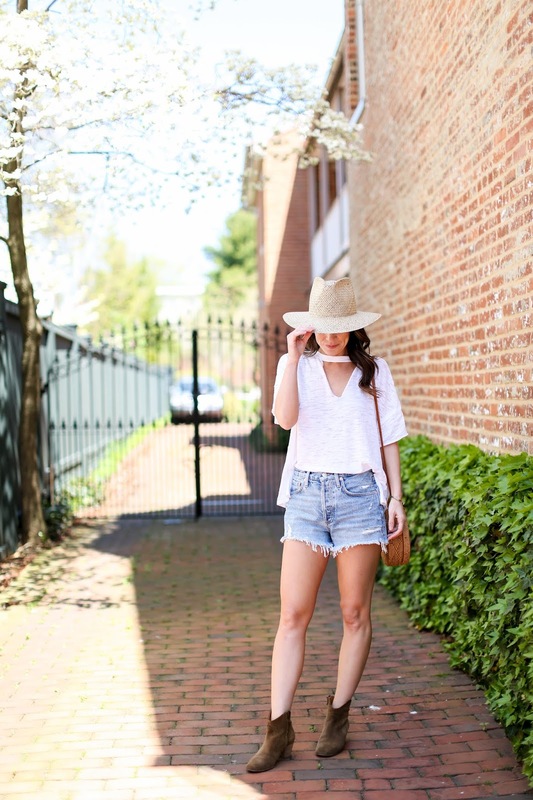 Denim cut-offs - I have been looking for the perfect pair that fits well, isn't too short and has the right amount of distressing. These are it! As I have mentioned before, these wedge sandals are my best shoe buy of the season. So comfortable and they go with everything (see me wearing them here, here and here). This round rattan bag sold out almost instantly, but I have found a ton of almost identical ones. The style is so versatile and can be worn with almost any spring/summer outfit (see how I styled it here and here). And finally, a good white tee is a necessity. 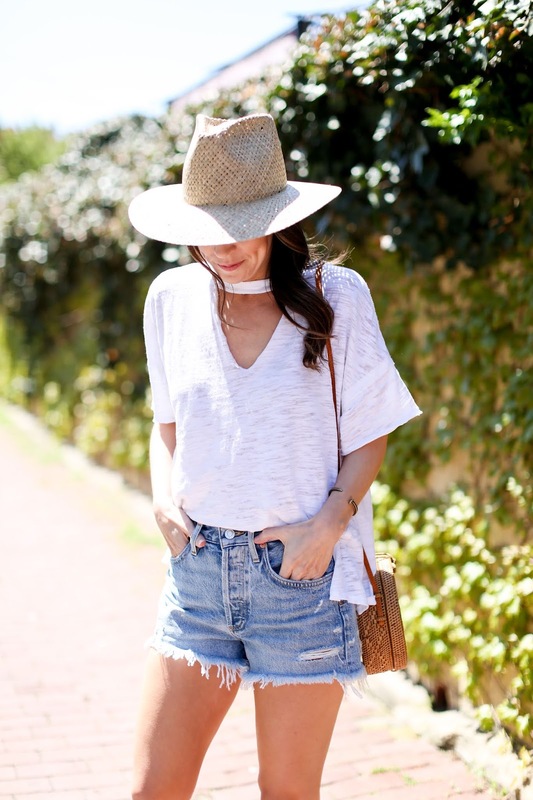 I love that this one is a bit different with the cut out at the neck, but a simple tee is also always a good idea to have in your closet (this brand makes my favorite ones of all time). I feel like with these pieces in my closet, so many outfits can be created around them. They are all items that can be worn over and over with various looks. In addition to the pieces that I'm wearing, I found 10-15 more styles of each item and put them in the widgets below. Be sure to scroll through to see them all as there are a variety of price points and brands included. I have recently found you on social media and having searched for honest, well done reviews on skincare, beauty and fashion, I can honestly say my search is over! You are delightful, informative and funny with a wry sense of humour. I, too, am a skincare junkie and have been since I was a teenager (many moons ago). At the moment, I am very intrigued by Korean skincare and find their dedication fascinating! I suffer from chronic pain as well and perhaps that is where my love for skincare comes. It's something I can control and it makes me feel cared for. Is that the same for you? I also LOVE fashion, mostly designer and am envious of your collection of treasures. Well, I thought I would just drop you a line to let you know the joy you're bringing into my life. Thanks Paula! I appreciate all your kind words and support of my blog. I definitely agree with you on finding things to help distract from the chronic pain - beauty and skincare are ones that take my mind off of it as well. Both fashion and beauty are great distractions when things are challenging - even if just a small bottle of nail polish from the drugstore to have a moment of pampering. So happy you are enjoying the posts and thanks for reading!